This potato candy recipe is similar to one that my Irish grandmother used to make, updated for St. Patrick’s Day with a little green food coloring and green sugar sprinkles. It is very rich, so a small portion goes a long way. With a yield of over 2½ pounds, this recipe makes enough for a large platter to take into the classroom or lunch room on March 17th. Place the potatoes in a large mixing bowl, drizzle with melted butter, peppermint extract and food coloring. Use a food mixer, or a potato masher to thoroughly combine ingredients. Add icing sugar, one cup at a time, mixing each addition until food coloring is equally distributed and all lumps are gone. Line a nine by thirteen inch pan with tin foil. Press the potato candy evenly over the bottom of the pan. 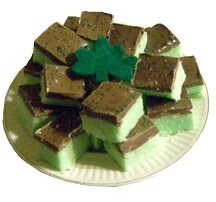 Melt shortening and chocolate and spread over the top of the potato candy. Let cool slightly, then cover with green sugar sprinkles. Refrigerate until set. Use the foil to lift the peppermint potato candy out of the pan, then fold the sides of the foil away from the candy. Cut candy into one inch squares. Store in an airtight container until serving, separating layers of candy, if necessary, with wax paper.